Pretty uncommon to come across a car parked in such a great spot for photos. 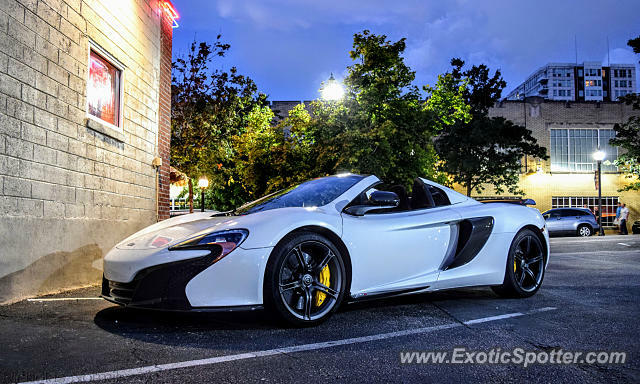 Decided to drive through Glenwood South a couple weeks ago on a Friday night and saw this 650S Spider parked in one of the restaurant lots. Had a child seat in the passenger seat. Hope the owner got out there before it started raining too hard, because it really started pouring not long after I left. I'm hopefully going to make a quick trip down to Clt next week if I can change my schedule around a bit at work. It's been almost two months since I've been there, feels so weird lol. Cool spots, hope you post some of them on here if you haven't already! I saw a 90s Rolls on my way to work on Tuesday but missed getting any pics, and yesterday I had to take my car up into north Raleigh to have something looked at and saw a Guilia Quadrifoglio followed by a GranTurismo Sport, but other than that I haven't really seen anything since last weekend. Oh nice! Past few days have been more prosperous. Tesla Roadster, 2 GranTurismo, 1 GranTurismo MC, custom R8 v8, Flying Spur, Arnage, V12 Vantage S, Cali T, and a new R8. Caught them all but the Bentleys, however I think they are the same ones I have pictures of from different times. Whoa that's a weird place to drive a Huracan. I've seen tons of Huracans around Charlotte but I've only seen one here in the Triangle, a white LP610 in Cary a year or so back. Tonight in Raleigh I did catch a Wraith/Phantom combo as well as a new R8 V10 Plus, so those were cool. I think it was the same R8 that @BugattiBoy posted a couple days ago. Sadly not many this summer but I have seen some in the past few days. I've been as a camp counselor in the mountains all summer and there were no cars there. I saw a Ghost and Silver Shadow while driving there from Charlotte but no pics, and I saw a repeat R8 in Charlotte (already had pics). I did actually see a customized white Huracan at some random strip mall on Independence but missed it as well as missing a California and GranTurismo in Wrightsville yesterday. I've only been spotting for a year but I've seen only 1 mclaren, a 720s. Its owned by the guy who also has a p1. Also @mazdafreak nice to know we can be seeing more spots from raleigh from you! Thanks, I had my DSLR with me so I was able to shoot in full manual and get the exposure I wanted for better clarity. There seem to be more and more McLarens popping up around here that I haven't heard of, but they're no more common than in Charlotte. Ferraris and Lambos are a lot more common in Charlotte than here though. On that topic, I heard that Lamborghini Carolinas decided to just move its headquarters from their Greensboro store to their new Charlotte store, and close the Greensboro store, BUT it will be taken over by a new store called Carolina Exotics that will sell Lamborghinis and McLarens. So far I have just heard it through another forum I'm on, but once I see an article about it I'll definitely let you know. You seen any nice cars lately? I took a job in Cary so I don't have many opportunities to make it down to Charlotte anymore, and have to just resort to what I see driving to and from work as well as my once-or-twice-a-week spotting expeditions into Raleigh on Friday and Saturday nights when I work evenings. Hey, somebody's got some cool parents.